Please refer to our stock # T 1707 Multi when inquiring. 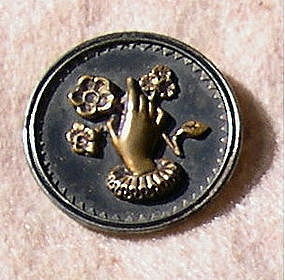 (C) Madonna and Child Sistine Chapel stamped metal with 6 winged cherubs and stars - just over 1" - images 4, 5, 6. All have metal loop shanks and some show appropriate softening brass relief areas for age. Condition: good 100+ year. $10 USPS priority/ins/Track or free with USA Ck/ USPS MO . Please collect with confidence after reviewing the dozens of verified testimonials then view All 12 close up images for more detail and price as all Qs will be answered here in lieu of email reply. Button dealers for best % off: With your Store /Business info, 3 item minimum and your USA Ck or USPS MO - receive the best % off and receive Free USPS Prior/Ins/Track. Please visit www.mimideeartwear.com and search every image for changes.